Well, tonight is my Stampers 6 gathering (we'll miss you Shannon!) So far I've done the "same layout, different card" theme. Tonight I thought I'd be a bit crazy, ready for this....."same layout, SAME STAMP SET.....different type of colouring !" Isn't that just nutty!?! I know, it's March BUT it feels like Christmas! We've gotten over 30 cm of snow over the past few days and it's beautiful so therefore a Christmas card is well deserved!!! Actually that and Jodie has been asking to make one! 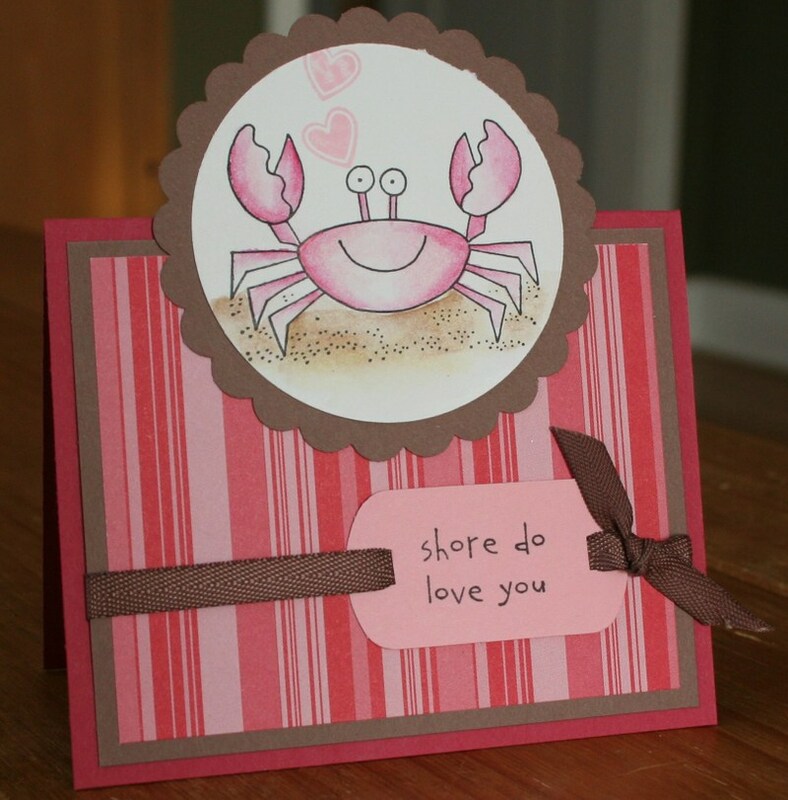 This card is coloured in using the Watercolour Pencil crayons and a blender pen on Whisper White cardstock. I did a bit of masking on him to have the hat look like it's behind his eyes. All of the cards use the rounded tab punch (forget the real name for it). The greeting is stamped on it and then the ribbon is fed through the tag. This card is made using the watercolour wonder crayons and a blender pen. An aqua painter works really well as well. I have stamped the image in Staz On and then coloured it in using the crayons and then blended with the blender pen. Other: CHECK OUT THE RIBBON....it's the new Chocolate twill from the mini.....YUMMY! I know it's hard to see in the picture but it is SO soft and ties BEAUTIFULLY! I think on Whisper White Cardstock this is my favourite way to colour. This last card is my favourite overall card. I LOVE the colours and the little cut out and punched up images. 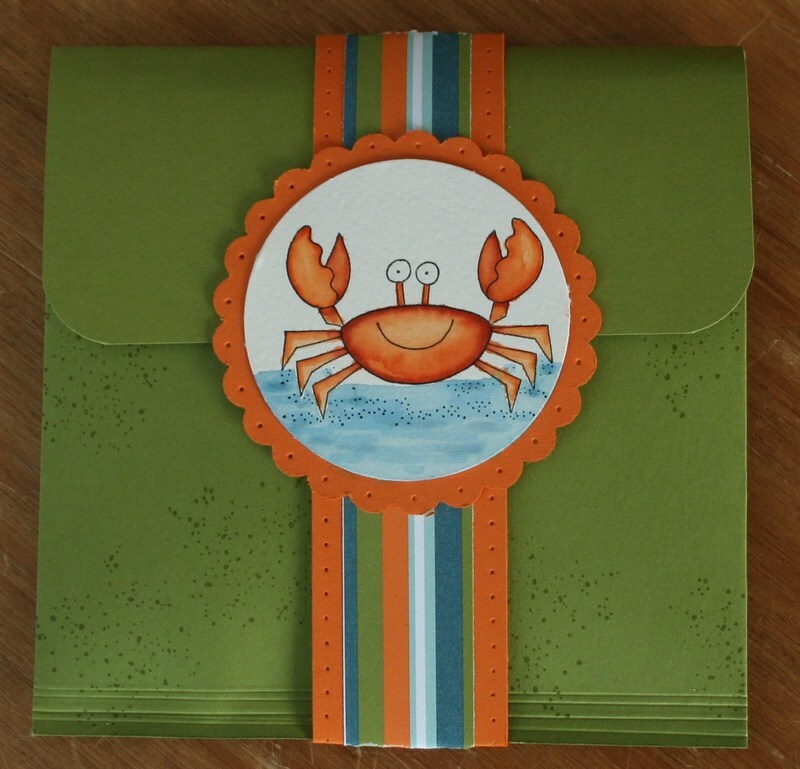 This crab is coloured in using a blender pen and ink from the lid of the ink pads. This always gives a nice soft effect. 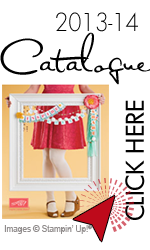 The present and cupcake are cut out of the whisper white cardstock and then attached with a dimensional. Well, hopefully you enjoyed the CRAZY twist on this month's Stampers 6! Adorable cards! 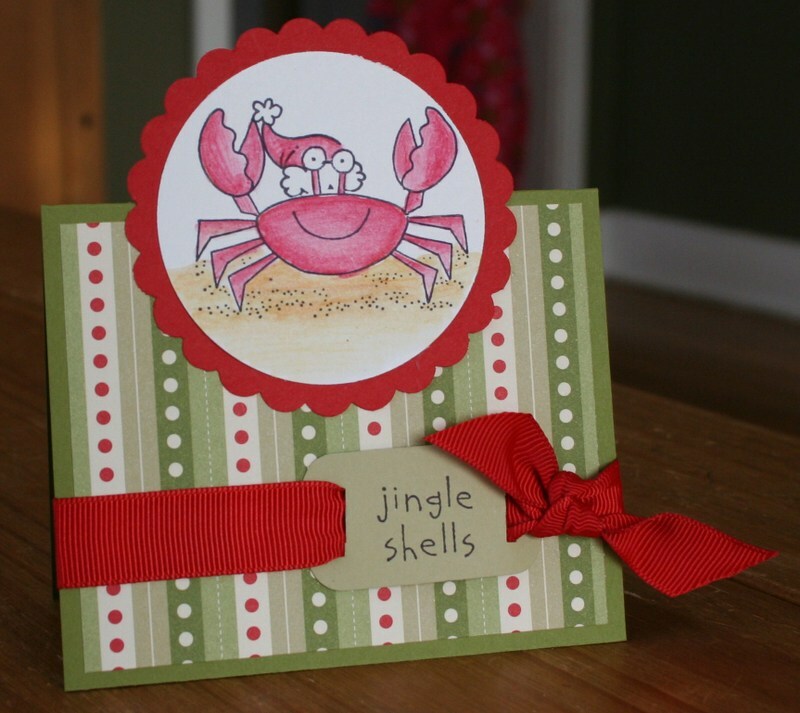 I am sure they will love learning all the neat ways to color in this cute crab! Just wanted to say that I had a great time last night, thanks for the layout!!! 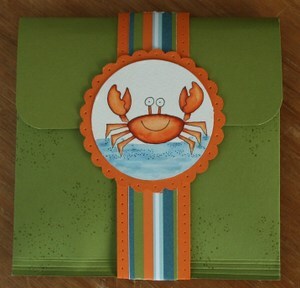 So fun, I am REALLY enjoying this stampers 6! Awesome idea. Love all the cards....especially the little guy in the Santa hat! This class was so much fun, I love the cards, and can't wait for my stamp set to arrive!!! Once again LOVE IT!! 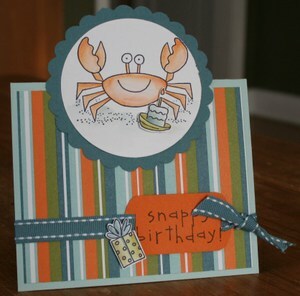 I love the Mr.Crabby Pants creation that you did. 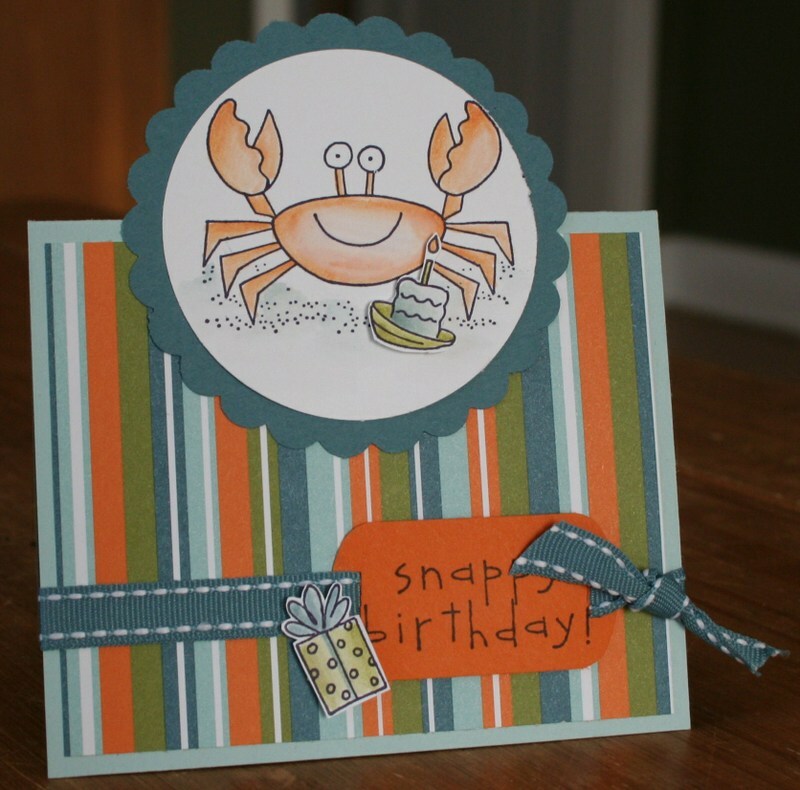 You always make things so creative and fun...I'm sure your Stampers 6 love it. Great idea for the class.